Inspired by Lewis Miller's Flower Flash and the floral mohawk which adorned The Crosby Street Hotel’s Botero Cat last spring, these spiky stems look like giant brushes dipped in bright purple paint. 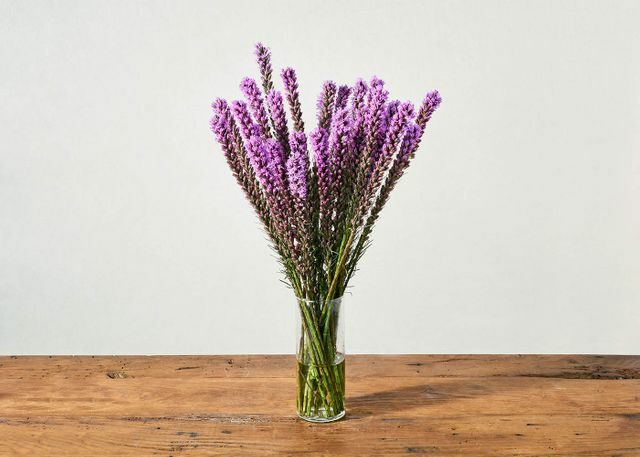 Liatris is one of the only flowers to bloom from the top down, making them a great match for the rule breaker and original thinker in your life. A clutch of these striking blooms have transformative powers, just as they changed the iconic cat sculpture into a punk rock skunk, they are certain to elevate any room in your office or home. A Flower Flash is an urban street art installation created by Lewis Miller and his team of merry, floral bandits. The New Yorker coined Lewis, The Banksy of Floral Design as these Flower Flashes are created under the cover of darkness, usually before dawn and always with living flowers. Using trash cans, construction sites and iconic statues all over New York City, Lewis makes these random acts of flowers and kindness simply to bring joy to everyday New Yorkers. The installations are fleeting but the feeling of goodwill lasts. By purchasing this Flower Flash inspired arrangement, you too are creating an act of goodwill. Portions of the proceeds go to ProjectArt, an organization that empowers youth through free after-school arts education.